PenDelfin "Biscuit Midge", with 4 Crumbs. Rare. This old piece is rare since Biscuit Midge has 4 Crumbs on her lap. All have Pen Delfin markings on the underneath. - Inspire our people and partners to unite behind our purpose. Hobbies, Sport & Craft. Our purpose is to transform the lives of the UK's most vulnerable children. PenDelfin "Biscuit Midge" with 1 Crumb. PenDelfin "Robert with Satchel ", Pre-owned, Very Good Condition. As the UK's number one heart charity, the cutting edge research we fund has already made a big difference to people's lives. Total Weight: 8 kg. PenDelfin "Milk Jug Stand". Good Condition for it's age. Pendelfin SNUGGLES AWAKE pink colourway brand new in original box. Condition is New. Dispatched with Royal Mail 1st Class. There appears too to be a slight restoration to the top of the left ear. I have tried to show these clearly in the photos. Pendelfin Rabbits X 7. Condition is Used. Dispatched with Royal Mail 2nd Class. Smoke free home, bit dusty and a few chips, see photos. PenDelfin " Uncle Henry ", Signed Limited Edition. Excellent Condition. PenDelfin "Uncle Henry". With Certificate of Authenticity. Signed Limited Edition. PenDelfin "Aunt Ruby ", Limited Edition. Excellent Condition. PenDelfin "Aunt Ruby" Limited Edition with Certificate of Authenticity. Condition is Used. The box is for the piano but both fit into it. PenDelfin "Barney Bundle". Pre-owned, Excellent Condition. PenDelfin Lucy Pocket. The apron is painted in rare lilac colour. pendelfin collectables Plates And Figures. 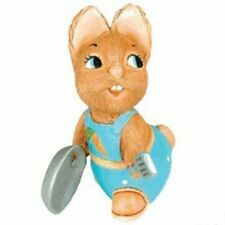 pendelfin collectables Plates And Figures consisting of 3 plates boxed and with certificates, and 2 rabbits Pipkin boxed and 1 rabbit wigs no box. All in perfect condition. PENDELFIN BROWN FATHER MOUSE. WITH LABEL AND GREEN BAIZE. EXCELLENT CONDITION. PenDelfin "Striker", Canadian Shirt. Pre-owned, excellent condition. 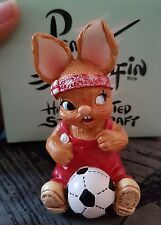 IHERE WE HAVE FOR AUCTION a lovely very Rare Vintage Collectable Pendelfin Figure the gaffer excellent condition.ANY FURTHER QUERIES PLEASE FEEL FREE TO EMAIL. Pendelfin Stoneware Rabbit Shiner Lilac No Bruise. Condition is Used. Dispatched with Royal Mail 2nd Class. PENDELFIN GALLERY ROBERT. WITH LABEL AND GREEN BAIZE. 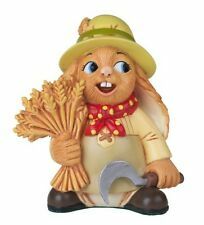 Pendelfin COOKIE collectible bunny brand new in original box. Condition is New. Dispatched with Royal Mail 1st Class. Pendelfin picnic stand with cherry pie. Rare colour. Pendelfin picnic stand with cherry pie. In good general condition. Green cloth. ONLY EVER BEEN IN CABINET. PenDelfin stacking teapot cup & saucer all with rabbit motif. Hand decorated bone china by. Pendelfin Bill the builder. Condition is New. Dispatched with Royal Mail 2nd Class. Pendelfin "Dandy" rabbits. Made in Burnley, England. 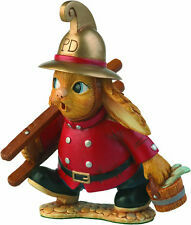 Pendelfin Rabbit 'Bosun' ~ featuring the rabbit as a sailor with a parrot on his shoulder. 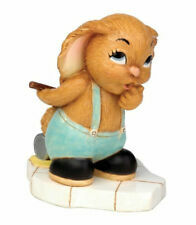 VERY CUTE PENDELFIN BUNNY 'DODGER' IN ORIGINAL BOX SIGNED JWH. Made in England. Des No. 2038755. Approx 9 cm tall. A great item for the collector. PenDelfin "Scout", Black Sleeping Bag. 2 Sausages and 2 Ladybirds. PenDelfin "Scout". This "Scout" has a Black Sleeping Bag, 2 sausages and 2 Lady Birds.This makes it unusual. It is unboxed. PENDELFIN BELLMAN, (TOWN CRYER) WALL PLAQUE-RARE-SMALL, APPROX 8CM X 5CM. This is the pendelfin small wall plaque of the original bellman or town cryer. Pendelfin "Bathtub" Wooden Lined Bathtub with Lady Bug NIB! Vintage Pendelfin Dog Figurine "TAMMY"